Nongprue residents were given their first chance to gripe or ask questions about a new road being paved through their neighborhood. Nongprue residents got their first chance to gripe or ask questions about a new road being paved through their neighborhood. 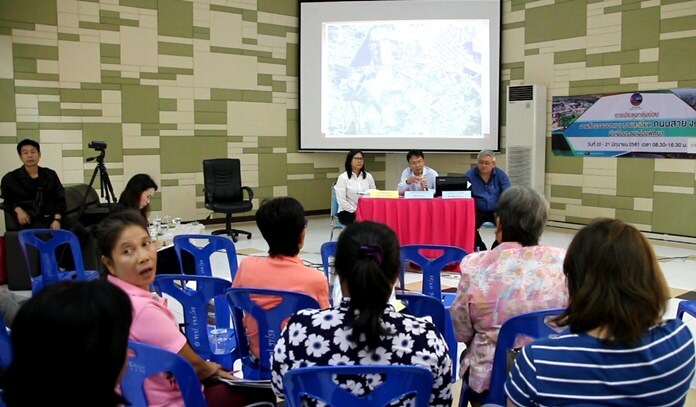 The Chonburi Highway Department held the June 21 public hearing at Nongprue Kindergarten, inviting residents within 100 meters of the planned Ngor 1 local road to give their input or ask questions. The 17.7-kilometer road cuts through Nong Plalai, Nongprue and Huay Yai sub-districts. It’s aimed at relieving traffic congestion on major boulevards. Ngor 1 will connect to all area highways and major roads. The hearing offered details of the project, outlined the environmental impacts and outlined public participation. No date for construction was given. Is Pratamnak Road open yet?